Consistently meeting customer needs is what we do best at Kore Mart. We maintain an extensive inventory of products and materials and provide the services you'll need for all of your production requirements. Here are some of the other affordable, high-quality products we offer. K70 pouring ladles: These are lightweight-yet-durable pouring ladles made with post-impregnated, reinforced RCF often used by aluminum foundries. Manufactured to industry standard sizes to better fit existing shanks, our K70 ladles have a capacity of about 25 pounds. K100 pouring lades: These durable, lightweight pouring ladles have a capacity of approximately 30 pounds. As with our K70s, they are made to industry standard size and post-impregnated with reinforced RCF. Sample spoon ladles: We offer a choice of four different spoon ladles with flat-bar handles to make connections easier. Post-impregnated with a ceramic engineered hardener, our spoon ladles are designed to last longer than similar ones available elsewhere. Sizes range from 4-6 inches in diameter. Increase your precision with pouring with our slag donuts, which sit inside the ladle and function as a dam to ensure liquid metal hits the spout. 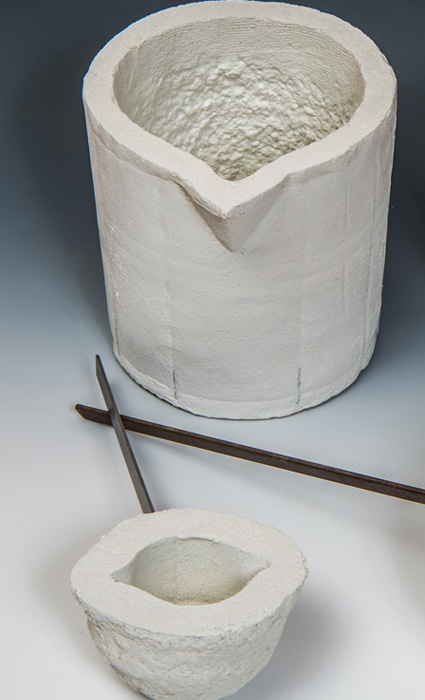 Available in an assortment of sizes to match your ladle diameter, our slag donuts are also manufactured with post-impregnated, vacuum-formed fiber. Make your processes more efficient by finding all of the products and materials you need from Kore Mart. We invite you to take advantage of our responsiveness, affordability, and attention to detail. Contact us today to let us know how we can serve you.